Johns Hopkins University led U.S. universities in research and development spending for the 37th straight year in fiscal year 2015, putting a record $2.306 billion into projects to cure disease, promote human health, advance technology, and expand knowledge of the universe and ourselves. 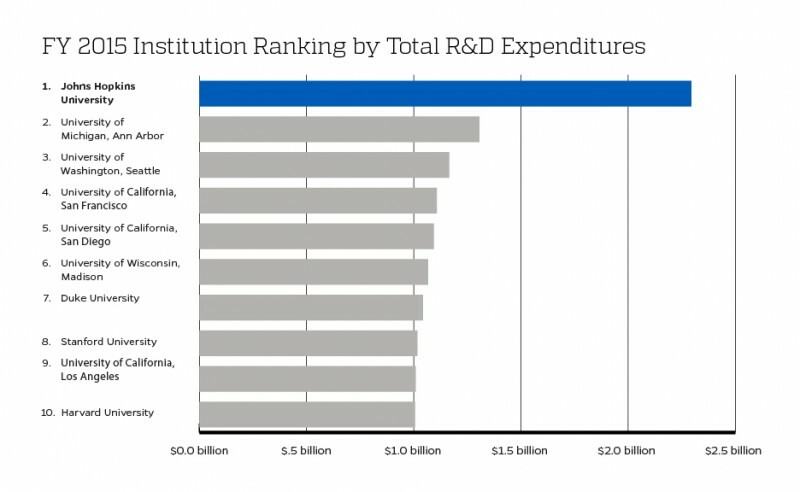 That total R&D expenditure in fiscal year 2015—the most recent year for which nationwide data is available—was 2.8 percent larger than Johns Hopkins’ research spending in 2014, according to the recently released annual National Science Foundation report on institutional R&D. The University of Michigan again ranked second in total R&D with $1.369 billion spent. Rounding out the rest of the top five were the University of Washington, Seattle, at $1.181 billion; the University of California, San Francisco, at $1.127 billion; and the University of California, San Diego, at $1.101 billion. The NSF also again ranked Johns Hopkins first on its separate report on research expenditures that were paid for with federal dollars. The university spent $1.993 billion in 2015—also a record and up 2.2 percent—on projects that were sponsored by NSF, the National Institutes of Health, NASA, the Department of Defense, and other federal agencies. 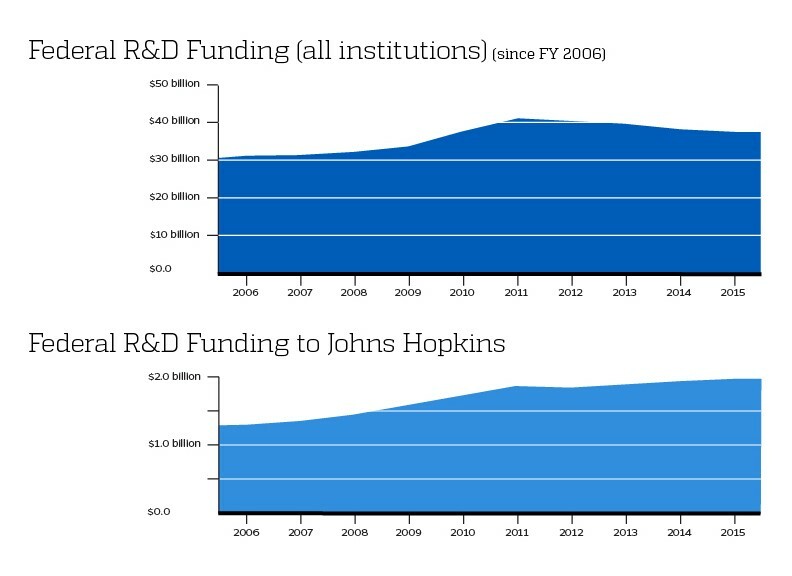 Federally sponsored research expenditure at Johns Hopkins grew last year from $1.950 billion in 2014, while the total of R&D backed by the federal government at all U.S. universities fell for the fourth straight year. From a high of $40.77 billion in fiscal 2011, federal support for higher education R&D was down to $37.88 billion in 2015. Johns Hopkins has led the NSF’s total research expenditure ranking each year since 1979, when the agency’s methodology changed to include spending by the university’s Applied Physics Laboratory—a research-focused division based in Howard County—in the university’s totals. APL reported $1.328 billion in total R&D expenditures in FY 2015, $1.283 billion of that federally funded. In fiscal year 2002, Johns Hopkins became the first university to reach the $1 billion mark on both the total and federal R&D spending lists, recording $1.4 billion in total research and $1 billion in federally sponsored work that year. The total funding ranking includes research support not only from federal agencies, but also from the state, foundations, corporations, and other sources. 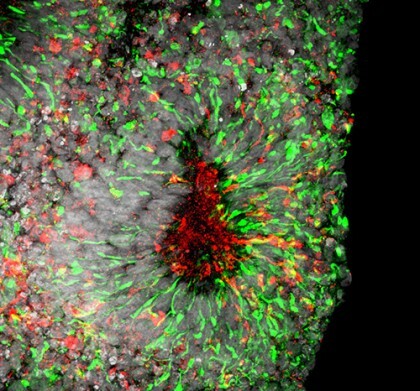 Johns Hopkins research is also supported by the return on investment made in past discoveries. In fiscal year 2015, Johns Hopkins reported earning $17.9 million by licensing patented technology, a figure that more than tripled to $58 million in 2016. The university also spun off 16 new companies and received 112 new patents in 2015, figures that increased to 22 and 153, respectively, in the most recent fiscal year. 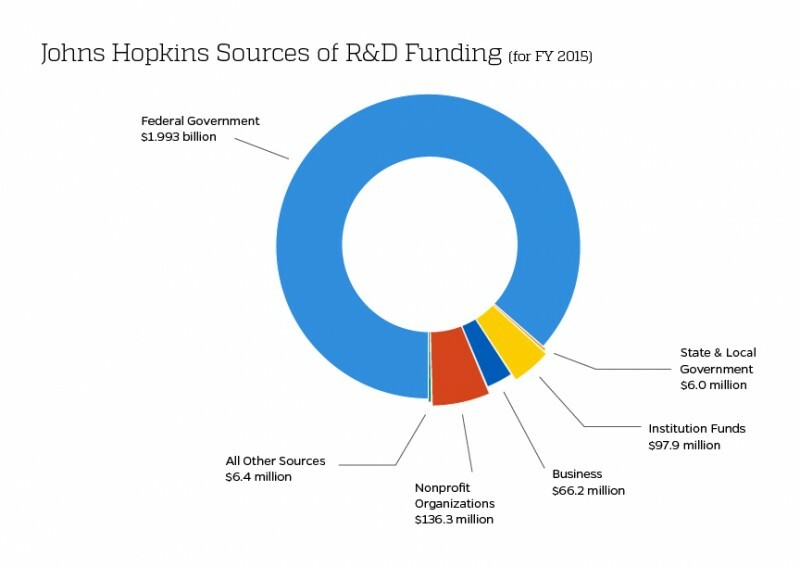 The largest components of Johns Hopkins R&D spending in fiscal 2015 were in the fields of engineering, at $992 million; and the life sciences, at almost $868 million. Looking at all U.S. colleges and universities—905 were included in the survey—total research spending in 2015 rose slightly, to $68.808 billion in fiscal 2015 from $67.351 billion in 2014. The portion that came from federal agencies fell, however, for the fourth straight year to $37.877 billion, dipping just 0.22 percent from 2014 but nearly 7.1 percent since 2011. When adjusted for inflation, federal support for university science has fallen 13 percent in that time. The fiscal year 2015 NSF survey results and links to related data tables are available online. A massive cluster of yellowish galaxies, seemingly caught in a red and blue spider web of eerily distorted background galaxies, makes for a spellbinding picture from the new Advanced Camera for Surveys aboard NASA’s Hubble Space Telescope. 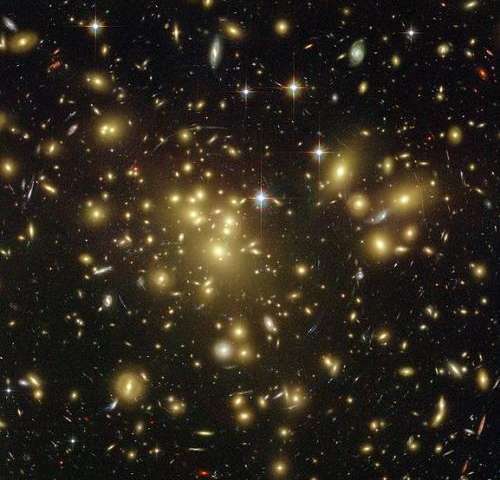 To make this unprecedented image of the cosmos, Hubble peered straight through the center of one of the most massive galaxy clusters known, called Abell 1689. The gravity of the cluster’s trillion stars — plus dark matter — acts as a 2-million-light-year-wide lens in space. This gravitational lens bends and magnifies the light of the galaxies located far behind it. Some of the faintest objects in the picture are probably over 13 billion light-years away (redshift value 6). Strong gravitational lensing as observed by the Hubble Space Telescope in Abell 1689 indicates the presence of dark matter. Credit: NASA, N. Benitez (JHU), T. Broadhurst (Racah Institute of Physics/The Hebrew University), H. Ford (JHU), M. Clampin (STScI),G. Hartig (STScI), G. Illingworth (UCO/Lick Observatory), the ACS Science Team and ESA. phys.org. In a paper published today in Physical Review Letters, the team of astrophysicists argues that these extremely bright and brief flashes of radio-frequency radiation can provide clues about whether certain black holes are dark matter. Muñoz wrote the paper along with Ely D. Kovetz, a post-doctoral fellow; Marc Kamionkowski, a professor in the Department of Physics and Astronomy; and Liang Dai, who completed his doctorate in astrophysics at Johns Hopkins last year. Dai is now a NASA Einstein Postdoctoral Fellow at the Institute for Advanced Study in Princeton, New Jersey. The paper builds on a hypothesis offered in a paper published this spring by Muñoz, Kovetz, and Kamionkowski, along with five Johns Hopkins colleagues. Also published in Physical Review Letters, that research made a speculative case that the collision of black holes detected early in the year by the Laser Interferometer Gravitational-Wave Observatory, or LIGO, was actually dark matter, a substance that makes up 85 percent of the mass of the universe. Key to the argument is that the black holes that LIGO detected fall within a range of 29 to 36 solar masses, meaning they are that many times greater than the mass of the sun. The new paper considers the question of how to test the hypothesis that dark matter consists of black holes of roughly 30 solar masses. That’s where the fast radio bursts come in. First observed only a few years ago, these flashes of radio frequency radiation emit intense energy, but last only fractions of a second. Their origins are unknown but are believed to lie in galaxies outside the Milky Way. If the speculation about their origins is true, Kamionkowski said, the radio waves would travel great distances before they’re observed on Earth, perhaps passing a black hole. 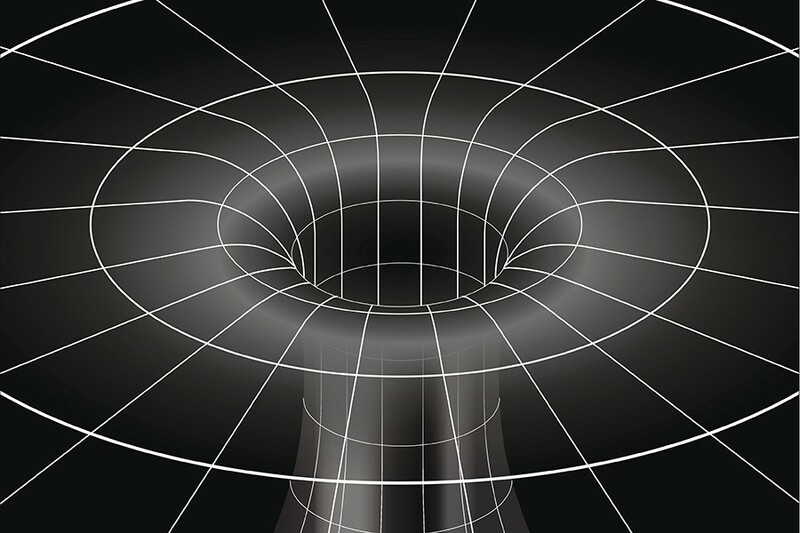 According to Einstein’s theory of general relativity, the ray would be deflected when it passes a black hole. If it passes close enough, it could be split into two rays shooting off in the same direction—creating two images from one source. So far, only about 20 fast radio bursts have been detected and recorded since 2001. The very sensitive instruments needed to detect them can look at only very small slices of the sky at a time, limiting the rate at which the bursts can be found. A new telescope expected to go into operation this year that seems particularly promising for spotting radio bursts is the Canadian Hydrogen Intensity Mapping Experiment. The joint project of the University of British Columbia, McGill University, the University of Toronto, and the Dominion Radio Astrophysical Observatory stands in British Columbia. “Once the thing is working up to their planned specifications, they should collect enough FRBs to begin the tests we propose,” said Kamionkowski, estimating results could be available in three to five years. It turns out the “DASH” diet, designed and proven to reduce blood pressure, is also good for your kidneys. A new study from Johns Hopkins University found that people whose diet aligned with DASH principles had significantly lower risk of developing chronic kidney disease over the course of more than two decades. DASH—short for “Dietary Approaches to Stop Hypertension”—emphasizes eating vegetables, fruits, nuts, whole grains, and low-fat dairy, while limiting sodium, sugary foods and drinks, and red and processed meats. Designed in response to tests by the National Institutes of Health, the diet is meant to provide key nutrients that play a role in reducing hypertension. Though past research has shown a number of positive outcomes from DASH beyond blood pressure benefits—such as preventing chronic cardiovascular disease—this new study from the Bloomberg School of Public Health is the first to focus on impacts to the kidneys. 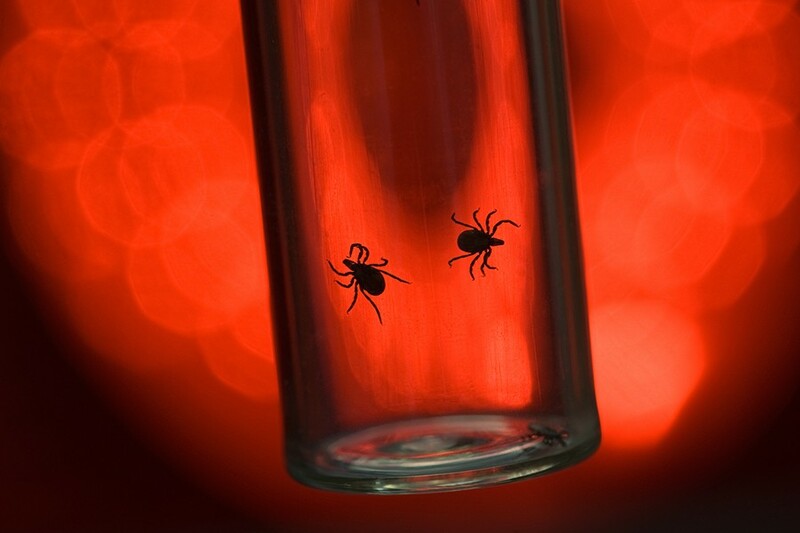 The findings were published Aug. 9 in the American Journal of Kidney Disease. Researchers estimate that kidney disease affects 10 percent of the U.S. population— more than 20 million people. However, less than one in five who have kidney disease are aware of their condition. The Hopkins research team found that study participants with the lowest DASH diet scores—those who ate few foods such as fruits, vegetables, and nuts, and consumed more red meat and sodium—were 16 percent more likely to develop kidney disease than those with the highest DASH scores—those who ate more of the healthier foods and less of the unhealthy items. The study followed a group of more than 15,700 adults for more than 20 years, starting in 1987. Although the DASH diet wasn’t studied and promoted until the 1990s, the participants’ reported diet habits were later categorized into a score based on DASH principles. Researchers also tracked whether these participants developed kidney disease over time. The study found that participants with the highest intake of red and processed meats were at a 22 percent higher risk of developing chronic kidney disease than those with the lowest intake of those foods. Those with the highest intake of nuts and legumes were at 9 percent lower risk of developing kidney disease than those with the lowest intake. Rebholz says the reason a DASH-style diet appears to align with kidney health may have to do with the known link between hypertension and kidney disease. Food acidity may also play a role—the foods that DASH promotes are low acid, while high dietary acid is thought to be connected to kidney disease.